I had a friend do the Heimlich on me in a pizza restaurant. It was pretty freaky there for about 30 seconds. A piece of flatbread pizza flaked off and got lodged in my airway, and I went down. He picked me up and got it out of there! Since then I've made all best efforts to verify the facts with Bryan, his representatives, and even his mother. None of them will back up his story. Per my previous item, when I tried to get answers to the following questions, Bryan's publicist declined to participate and his Nashville managers failed to respond to multiple inquiries. Who was the the friend who rescued Bryan? Did he seek medical care? What's the name and address of the pizza restaurant? Next I informed People Country editor Cynthia Sanz that Bryan's representatives wouldn't back up the story and asked if she intended to fact-check it. 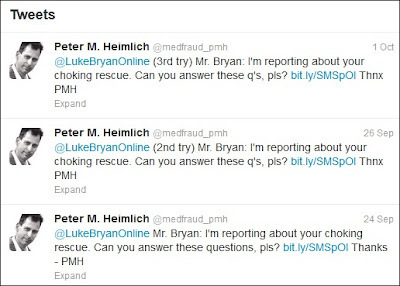 Since Team Bryan was giving me the silent treatment and People Country apparently didn't care whether what they published was accurate, I decided to ask Luke's mother, LeClaire Bryan of Leesburg, GA. Normally I wouldn't bother a relative, but Mrs. Bryan didn't appear to be a shrinking violet. On the contrary, she's been quoted in a number of media reports about her famous son and per his website, they've even co-hosted a TV show. Also, what mother whose son was rescued by the Heimlich maneuver wouldn't be tickled to hear from Dr. Heimlich's son? I speak from experience. Since my father introduced the treatment in 1974, countless people have told me that they or their loved ones were saved from choking by the maneuver and would I please thank my father on their behalf? That wasn't Mrs. Bryan's reaction. Although she was extremely cordial and gave no indication that my call was an intrusion, she refused to discuss the purported choking incident and informed me I'd have to talk her son's managers. I explained that I'd already made repeated attempts to do so and that the only reason I was reaching out to her was because they wouldn't provide me with the information. Again she insisted that she wouldn't discuss the matter, so I didn't press it. However, I did ask if she'd forward my questions to her son. She agreed and shared her e-mail address with me. 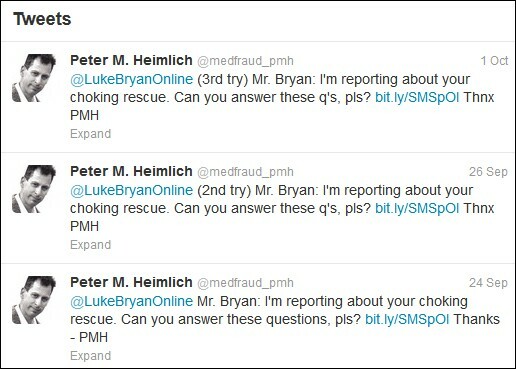 I then e-mailed her my questions and a subsequent follow-up asking if she'd forwarded the information to Luke. Next I contacted Coran Capshaw, the founder/president of Bryan's powerhouse management company, Red Light Management. Capshaw -- who launched the Dave Matthews Band and whose company handles a stable of big name talent -- was second in this year's Billboard Power 100 list of major players in the music industry. Later that day his assistant Zach Peters got back to me via a receptive e-mail. At his request, we then had a cordial phone call. Peters wanted to know more about the story I was reporting, so I showed him my previous blog item and explained that I hadn't reached any conclusions, but I didn't understand why no one would provide answers to my questions. Peters promised to make inquiries and to provide me with the answers to my who/what/where/when questions. So did the choking incident really happen? If not -- and I repeat if -- why would anyone fabricate such a claim? Per my previous item, choking rescues involving celebrities generate a passel of positive media coverage. The Bryan story was no exception -- it was picked up by dozens of country music websites. If the story is fiction -- yes, another if -- I wonder if first responders and others who have participated in life or death choking incidents would be amused? Since Luke Bryan and his people seem to be playing hide and seek with me, there's not much more I can do except send them the item you're reading with an invitation to respond. I hope the story turns out to be true. If any Sidebar readers ask Bryan or his representatives about this, I'd be interested in learning the results. Click here for his tour schedule.